This is a very difficult decision, but it is ultimately up to you to decide which route you want to take. You have two choices, be brave and go for it, or back down and take the easy way out. Even when all odds are stacked up against you and it seems there’s no possible way you can win, you have to do what you know is the right thing and not be scared of the consequence. You have to believe in this thing so much that you have the courage to face whatever may happen afterwards, because if you don’t it won’t be worth the trouble. If you truly believe in something then there is nothing that can stop you from making whatever decision you make the right one. 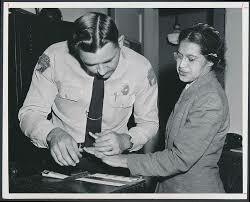 Rosa parks is a very courage’s person and she is cool.